Taylor was diagnosed with Cerebral Palsy the week of her first birthday. Her parents, Mark and Sarah, were initially told that with this diagnosis, Taylor might never be able to talk, walk, or even sit up on her own. After the diagnosis, Mark and Sarah started researching what kinds of services were available locally in Central Washington. That’s when the family found Yakima’s Children’s Village. Over the past 9 years of receiving services from Children’s Village, it has become a safe haven for their family. It is the place where Taylor has beaten the odds: she learned to crawl, feed herself, ride a bike, and even took her first steps with the help of a gait trainer and a treadmill. 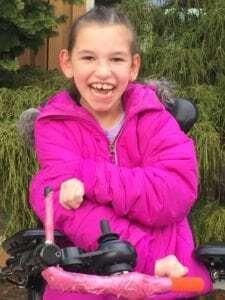 Children’s Village has helped provide the opportunity for Taylor to swim freely and effortlessly in its therapy pool, taught her how to drive her hot pink electric chair (don’t get in her way, she loves to speed), and with a little holiday magic provided her the chance to meet Santa Claus! And most recently, Taylor was given a voice through a communication device that allows her to speak freely amongst her friends. This past year, Taylor has been involved in a ballet program through Children’s Village’s Parent to Parent program. In partnership with Yakima’s School of Ballet, Taylor and her parents were given something they never had before: the opportunity to look forward to ballet classes and a recital that’s coming up at the end of the program. Taylor has transformed into a ballerina in front of our eyes and her parents count themselves lucky to have this opportunity available for her.